Back in 2011, political satirist Stephen Colbert recruited Radiohead for a special hour-long episode of The Colbert Report. Soon, Beatles legend Paul McCartney will be getting similar treatment by appearing on an hour-long version of the program next Wednesday (June 12) on Comedy Central/the Comedy Network. The Hollywood Reporter reports that the appearance will include an interview, in addition to renditions of songs from McCartney's current "Out There" tour (which will bring him through Canada later this summer). In a statement, the ever self-assured Colbert said, "I think this McCartney kid's got something special and I'm gonna put him on the map!" This marks the second time McCartney has appeared on The Colbert Report. In 2009, Colbert interviewed the singer for a segment called "Better Know a Beatle." 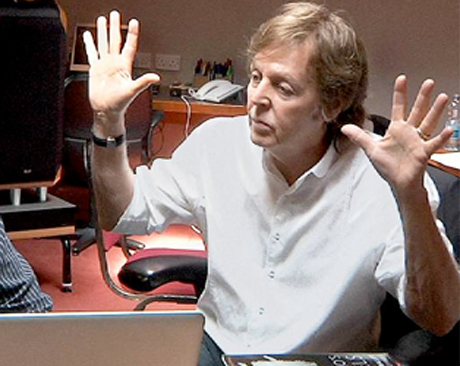 Check out McCartney's upcoming tour schedule here. Last month, he reissued Wings' 1976 live album Wings Over America as a deluxe box set.